Samsung's Galaxy S5 earned the top place in our thorough camera comparison immediately after launch, thanks to its improved 16 MP camera with ISOCELL sensor, which is able to produce consistently pleasing results in a variety of scenarios. The ISOCELL technology decreases cross-talk between adjacent pixel cells, plus the pixels have 30% larger full well capacity. This means that each individual pixel can receive more light before saturating itself, which results into an improved color dynamic range, and images with better color exposition. The improved light sensitivity results in better performance of the camera sensor in low-light conditions, too. Samsung didn't stop here, though, and wanted to derive the maximum of the sensor/lens/chipset/software combo. 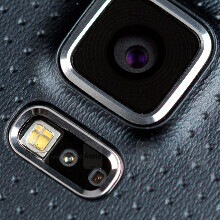 The company prides itself in two things in particular, when it comes to the camera of the S5. One is the ultra fast 0.3 seconds autofocus time, which is made possible by the new Snapdragon 801 chipset's 45% increase in image processing power, and the PDAF (phase detection auto focus) brisk focusing tech. Hence, they took pictures day and night, from sunrise to sunset in various weather conditions, even in the freezing cold of winter. The other is the always-on HDR mode, both for stills and video. To take a high dynamic range photo one needs to combine a few pics with different exposure settings, so processing those shots quickly, and seamlessly merging them in a single image, is quite the daunting task with the speeds that the Galaxy S5 shoots at. Samsung's engineers apparently used a separate sensor for the short and the long exposure part of the HDR snaps, and developed a proprietary algorithm to deal with the deluge of pixel data that results from combining the shots. They traveled the globe, and kept shooting over a thousand of images per day in all weather conditions, until they were pleased with the always-on HDR feature, that you can see demonstrated below. Our camera comparison comes to show that the effort put in developing the Galaxy S5 camera has definitely been worth it, do you agree? 'They traveled the globe, and kept shooting over a thousand of images per day in all weather conditions' - Wow that's some real dedication right there. Its not easy to beat Sony who've been producing camera lens for flagships for so long. the only company that could match Sony (and in this case even surpass it) is Samsung, although i think they'd be pretty equal if Sony got their algorithms right. Are you serious? Top DSLR lenses are made by SONY FYI..
And dslr have what to do with their smartphones? It doesn't matter if they make the lenses and sensors and everything else, they always underperform compared to other smartphones. Always. lolol. Still the only manufacturer whose phones take better pictures than Z2 is Nokia. It was only five minutes, but it was a tough five minutes. Samsung's marketing department really had to think of exactly how to best BS their customers. How many images per day? Hundreds? Too little. Millions? Not believable. Okay, thousands it is. Weather conditions? Baking hot sun? No, phone will explode if the camera is used that much. Ice cold winter? No, phone won't work right. Better to put "all weather conditions" so the legal department is happy. Okay, everyone, good work. Ship new marketing BS now! lol.....you wanna blind people ? They did none of this. Their marketing department worked hard, though. Not exaggerating but GS5's camera is one of the best to date! .. The amount of detail that it has is jus insane.. IMO its the closest thing to a pureview camera and in some situations it can even beat it..
some situations beat it? Would have to disagree. IMO that is. The camera is great no doubt about that, but i would put the pureview, 1020, icon/1520 up against this any day. But this is all IMO that is. The lack of natural colors is regrettable. Instead, the GS5 puts out pumped up fake colors. The Galaxy S5's lack of OIS is regrettable. All the major camera makers use OIS for their better cameras or lenses. Because it works well. The lack of dual tone flash is also regrettable. Samsung gave us a gimmick heartbeat sensor instead of dual tone flash. The lack of good low light performance is also regrettable. Other than the faster focus in good light situations, the new camera of the GS5 is just a bundle of regrets. I think you have a good point. Nokia Lumia camera hardware specs were good, but Lumia cameras were well known for terrible lag when taking pictures. The Samsung devices I have used have not had nearly as much lag.